Sigh. Why not just add fields, e.g. Just make sure your "notex" names don't conflict with any real fields. You can use JSON with comments in it, if you load it as a text file, and then remove comments from it. You can use decomment library for that. Below is a complete example. The practical answer for VSCode users in 2019 is to use the 'jsonc' extension. Practical, because that is the extension recognized by VSCode to indicate "JSON with comments". Please let me know about other editors/IDE's in the comments below. It would be nice if VSCode and other editors would add native support for 'json5' as well, but for now VSCode only includes support for 'jsonc'. It supports all PHP-style comments: /*, #, //. String literals are preserved as is. As many answers have already pointed out, JSON does not natively have comments. Of course sometimes you want them anyway. For Python, two ways to do that are with commentjson (# and // for Python 2 only) or json_tricks (# or // for Python 2 and Python 3), which has several other features. Disclaimer: I made json_tricks. JSON doesn't allow comments, per se. The reasoning is utterly foolish, because you can use JSON itself to create comments, which obviates the reasoning entirely, and loads the parser data space for no good reason at all for exactly the same result and potential issues, such as they are: a JSON file with comments. If you try to put comments in (using // or /* */ or # for instance), then some parsers will fail because this is strictly not within the JSON specification. So you should never do that. Yes, you can have comments. But I will not recommend whatever reason mentioned above. I did some investigation, and I found all JSON require methods use the JSON.parse method. So I came to a solution: We can override or do monkey patching around JSON.parse. *.json files are generally used as configuration files or static data, thus the need of comments → some editors like NetBeans accept jcomments in *.json. The problem is parsing content to an object. The solution is to always apply a cleaning function (server or client). "https://schema.org/comment": "this is a comment"
There are other libraries that are JSON compatible, which support comments. One notable example is the "Hashcorp Language" (HCL)". It is written by the same people who made Vagrant, packer, consul, and vault. I use commented JSON files to specify neuron shapes for my synthetic reflex systems. I also use commented JSON to store intermediate states for a running neuron system. It is very convenient to have comments. Don't listen to didacts who tell you they are a bad idea. // Do what you want with the JSON object. I came across this problem in my current project as I have quite a bit of JSON that requires some commenting to keep things easy to remember. This entire thread assumes that adding comments is the only improvement that needs to be made to JSON. If someone doesn't want comments in JSON because it's to be used for serialization, just omit the comments. The same goes for whitespace. But why stop there? 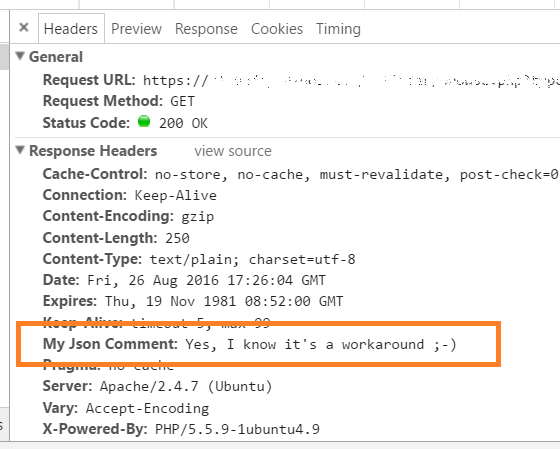 Why are quotation marks required in JSON? They add nothing useful. The only reason I can think of for JSON to be so rigid is if parsing is difficult. But it isn't. Almost any programmer can write a JSON parser, in either direction. Shorter than any existing JSON specification, but just as readable and more efficient. But please make quotation marks optional. Why? Because JSON cannot contain variable or function names (to avoid injection attacks), so quotation marks don't provide any disambiguation. We already know that all the data are strings. So, please, leave out the quotation marks already, unless they are really needed. Yes, you can, but your parse will probably fail (there is no standard).